Do not rush to throw away an old coat. Depending on wear, you'll be able to make from it for my vest, leggings, headphones, beret, the original shawl. Child will love this soft toy, rug, wall panels made of fur, and her husband warm insoles. Now a very trendy fur vest, it can make even young needlewoman. Better to sew it from natural fur. First of all, gently uplift the sleeves. For this you need to cut 2 threads sewn product which, in turn, pull the bottom and top. This will help small scissors or a special hook for ripping. If the sleeves are not pureed, set aside, they will need to create the kit. Cut the bottom of the coat to the vest from fur acquired the desired length. However, the fibers do not touch, cut only the back part of the canvas – the scrapings. If you have a sweater with a warm neck, then fight back the gate coats. If you are using a pullover, leave a collar of fur products. Hands stitch the junction of the armhole of coats with similar places on the sweater. Connect these two products and on the neckline. Unscrew on the wrong side of the bottom of the fur, sew it with the bottom part of the sweater. 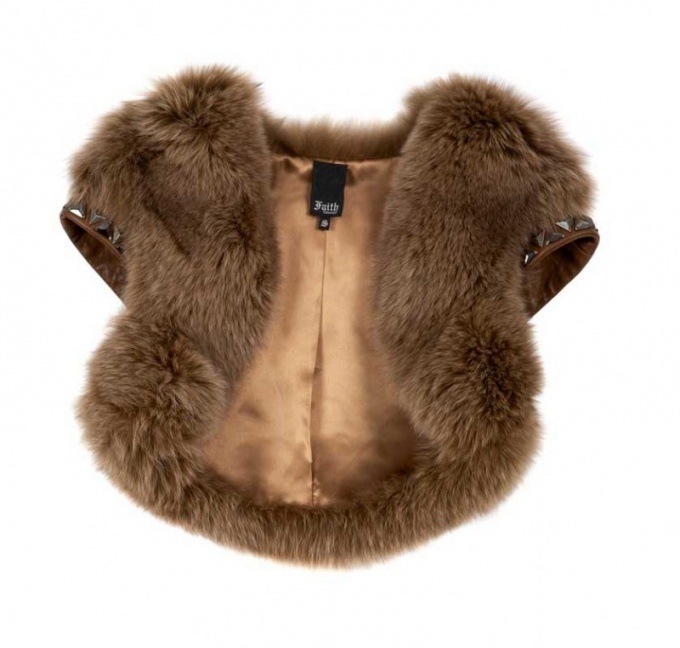 Trendy fur vest from old genuine fur coats are ready. Take the reserved sleeves, they'll make a stylish leg warmers. Trim the top of this part of the product, cutting it in a straight line. If the width of the sleeves allows, put them on top of the boots. In this case, if the boots without a zipper. If the lightning bolt strut seam of the sleeves, and sew on either side of him tight braid. Hands sew these places with a side panel zipper, leggings will be released together with boots. If the top of the arms wide, sew on the wrong side of the same ribbon, thread through her gum. From the remnants of old coats you can make headphones that will be a great addition to this set, as mittens. These things can be created from distressed faux fur, cut out the parts from the parts that are in good condition. Attach any mittens that fit you well to the wrong part of the fur of the canvas, outline in chalk, cut out 2 pieces for each, sew them. As the cuffs, you can use the Jersey from unnecessary sweatshirts, t-shirts or tie threads with spokes. Fashionistas can construct the hat and sew it from natural or artificial fur. To make takes obmerte head circumference, cm add 5 Divide the amount by 6, you get a figure "X". Draw a triangle, its base is "X". Height of this shape is equal to the distance from the top to the middle of the forehead. Cut out 6 triangles with the seam allowance on all sides in 1 cm Sew them together in the shape of a circle. At its edge, sew the knitted tape. You can sew the front visor, you get a fur hat. Pieces of faux fur you can sew a soft toy for a baby or a round pillow. Of tissue take 2 eyes and a smiling mouth, you'll get a funny pillow with a face. Shawls to cut several circles from faux fur with a diameter of 10 cm to Collect every stern thread. If the fur is thin, tamp the POM-POM wool. Sew them together, put in the form of a triangle, and the original shawl is ready.